This week the fleets were plagued by light wind across all three race areas. On the outside course RO Peter Crowley and his team managed to get the first race off in about 5knots of breeze from the north west. Peter took the decision to shorten all classes by one round just before the already light breeze faded away to nothing at all. Having waited around for about an hour the decision was taken to postpone racing till next week and the fleet headed home. 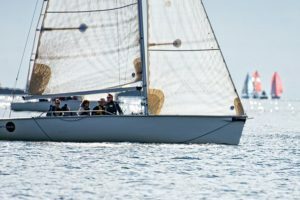 The Whitesail and Sportsboat fleets were not as fortunate and no race results were recorded as both courses had to abandon race one when the breeze died leaving the fleets helplessly adrift in the inner harbour. Northsails in conjunction with the ICRA training programme, were out with their media company Isla Media taking some great footage of the light wind starts and some action from the outside course at the top mark, see link to the video below. Light winds at the class three start resulted in the boats near the starting line clambering for a breeze distorted by their own efforts. Some made headway and some sat in the exhaust of those that did. No Gnomes and Fulmar Fever cleverly hit the line on committee boat end with a slightly late but momentum fuelled charge allowing them to lead the way towards what would be the only windward mark of the wind starved day. Flyover reached the top mark ahead of the pack with No Gnomes leading the chasers. They in turn were very closely followed by Sea Hawk with YaGottaWanna, Cracker, Jade and Fulmar Fever rounding to a downwind, where angles meant everything. The lads from Waterford with a substantial lead gybed their Sigma off to the left in search of pressure while the rest of the fleet kept right in a little more tide. No Gnomes were next to turn closely followed by YaGottaWanna and Sea Hawk with Cracker, Jade and Fulmar Fever electing to hold on to the right for a bit longer. Flyover seemed to have held their lead until perhaps being a little over cautious with their final gybe and over shooting the bottom mark by a margin, allowing No Gnomes, YaGottaWanna and Sea Hawk to pass them on the course. Looking forward to see you all on the water next weekend for the halfway point of the CH Marine Autumn Series.